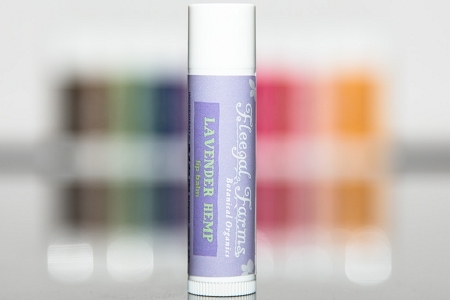 This Lavender Hemp Balm is so soothing to dry lips. It carries a light scent of lavender oil while hemp seed oil is full fabulous natural antioxidants nourish your lips. Our lip balms contain no petroleum products, only vegetable oils to sooth your lips. They come in nine flavors: Lavender Hemp, Mint, Sweet Orange, Vanilla Spice, Strawberry, Coconut Lime, Honey Almond, Pumpkin Spice and Fragrance Free. INGREDIENTS: oils of olive (olea europaea), organic extra virgin coconut (cocos nucifera), hemp seed (cannabis sativa), flax seed (linum usitatissmum), castor (ricinus communis), shea butter (butyrospermum parkii), beeswax, vit e (natural tocopherol), zinc oxide, stevia extract (eupatorium rebaudianum bertoni), lavender essentail oil.